Did you know that “doggie breath” isn’t one of your pooch’s inherent traits? It’s actually a sign of a problem—dental disease. Most of us don’t think about our pet’s teeth, but the truth is that dental disease is as common in dogs and cats as it is in humans. This disease is a frequent source of pain and often leads to poor general health, including liver, kidney and heart disorders. While cavities make up the majority of dental problems in humans, pets most commonly suffer from plaque buildup. This buildup often causes inflammation of the gums around the base of the teeth (gingivitis), which is a continuous source of discomfort and pain. If untreated, this will ultimately lead to periodontal disease with infection, bone loss, and tooth loss. 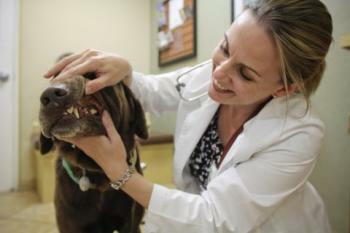 How can I prevent dental disease in my pet? Brush his/her teeth: Brushing your pet’s teeth is the best way to remove plaque before it turns into tartar. Feed a special diet: Some prescription diets have been shown to greatly reduce tartar buildup. These diets are made up of dry kibble too large to be swallowed whole. While chewing the kibble, special fibers literally scrape the plaque off the teeth without damaging the enamel. Use mouthwash: This product is added to your pet’s drinking water and reduces the bacterial count in the mouth, resulting in improved breath. See your vet regularly: Annual and bi-annual check-ups allow your veterinarian to catch potential problems early on. Schedule a professional cleaning: Depending on the severity of the dental disease, some pets may require an anesthetized cleaning below the gum line. Oral surgery may also be needed to scale deep below the gum line or to remove affected teeth.